One of the joys of living in another country is the opportunity to become aquainted with its cuisine – flavours you may never have experienced, ingredients you’ve never seen before and combinations you would never have dreamed off. Bhutan is not really known for its cuisine. A number of people have asked what the food is like so I’m going to dedicate this blog post to a summary of our experience of food and beverages in Bhutan so far. Leading up to coming to Bhutan, we didn’t really know what to expect with regards to the food. For the past couple of years in Australia, Jordi and I had been semi-vegetarian (or flexitarian as we like to call ourselves!) in an attempt to reduce our ecological footprint. We introduced meat back into our diets for a couple of months prior to our departure just so our systems would be ready for anything. But we needn’t have bothered! Our arrival in Bhutan at the beginning of March coincided with the first month of the Bhutanese calendar, which is one of two “No Meat Months” in Bhutan – essentially enforced vegetarianism for a month! In reality though, while all the meat shops close for the month, restaurants still seem to serve meat. The second “no meat month” (the fourth month of the Bhutanese calendar) is just about to begin. The first and the fourth months of the Bhutanese calendar are said to be auspicious months which is the reason for the ban on meat. The meat here tends to be of fairly poor quality. 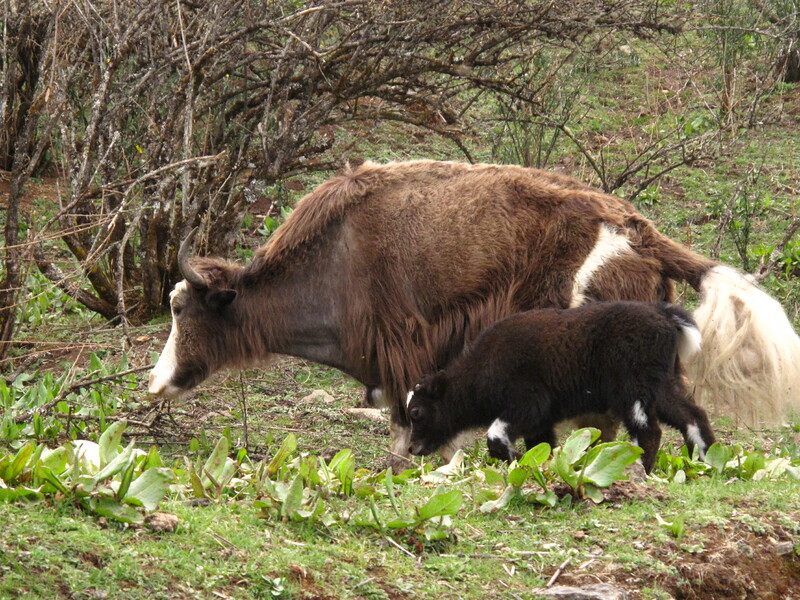 Even though pigs, chickens, yaks and to a small extent cattle are raised for their meat in Bhutan, the Buddhist way of life prevents many from actually doing the slaughtering. As a result, much of the livestock is sent across the border to India for slaughtering where the good cuts are kept and the remainder is sent back to Bhutan! So the meat dishes in Bhutan tend to be full of bones and fat and not much else. So, it has been quite easy to resume our ‘flexitarian’ diet! I did however, try Yak meat for the first time during a recent weekend at a homestay in the Haa Valley (3 hours from Thimphu). It was a little chewy, but quite tasty actually! In the absence of meat, we still get our protein from lentils, chickpeas, beans, nuts and eggs. I keep forgetting though that water boils at a lower temperature due to the altitude so cooking a hard boiled egg takes longer! To a small extent there are also some dairy products available. While the milk is mostly UHT, there is a locally made fresh yoghurt and a local white cheese known in Dzongkha as datsi. It’s even possible to get ice-cream at our local grocery store. At the beginning it was a bit hit and miss whether it was in stock, but now with all of us Aussies living around the corner the shopkeeper told us he’s keeping the freezer full because we all keep buying it! 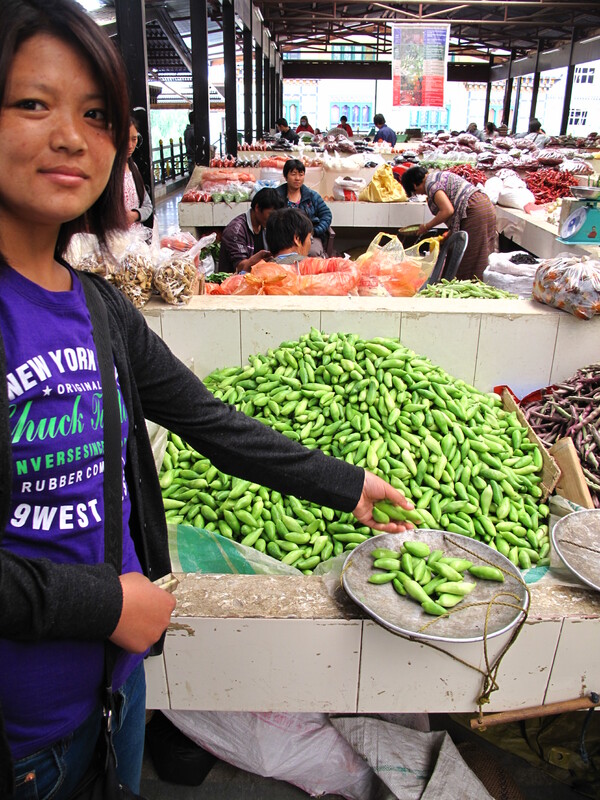 The staple foods of the Bhutanese are rice and chilli – lots of chilli! The national dish is Ema Datsi (Chilli Cheese). And our experience so far is that many of the other dishes are variations on the same theme ie Potatoes with chilli and cheese, beans with chilli and cheese etc. One of my favourites is fried ferns with chilli and cheese. The local rice is known as red rice – it is a small grain with a reddish tint and a nutty flavour. It is the only variety of rice that grows at high altitude. 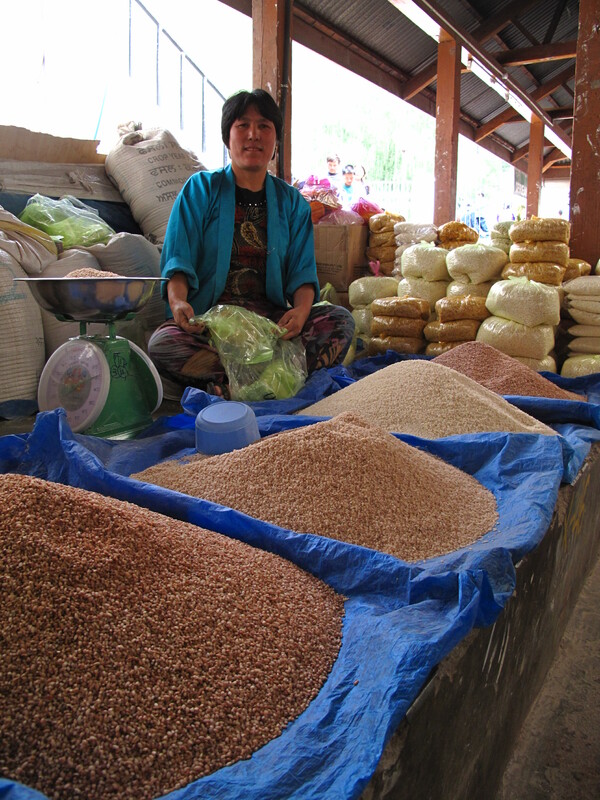 White rice and other varieties of rice are also available but are likely to have been imported or grown in southern Bhutan at lower altitudes. Buckwheat and corn are also grown in Bhutan and are a regular addition to the Bhutanese diet in the form of buckwheat pancakes, buckwheat noodles and dried corn mixed with rice. We mostly cook for ourselves at home and go out for a meal once a week or so. 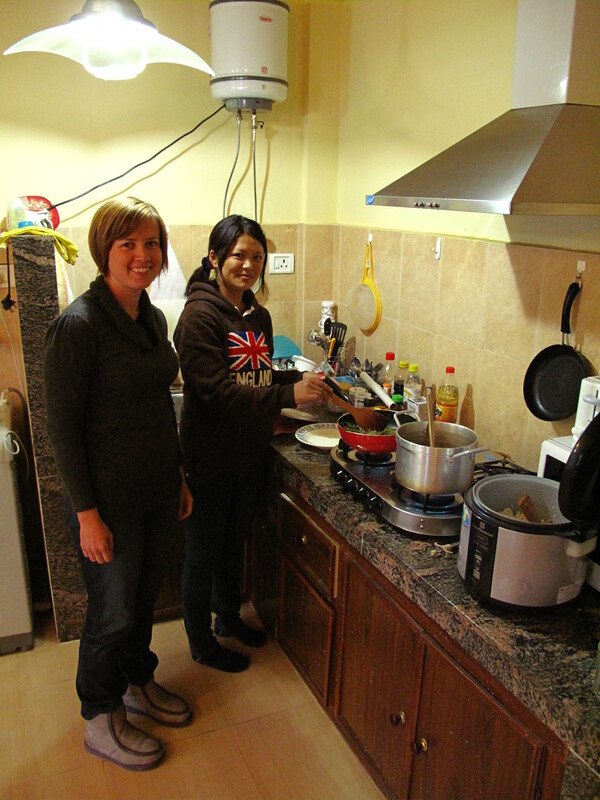 Most Friday’s we have a cooking lesson with a new Bhutanese dish each week. We don’t have an oven, but we do have a gas cook top and a microwave. 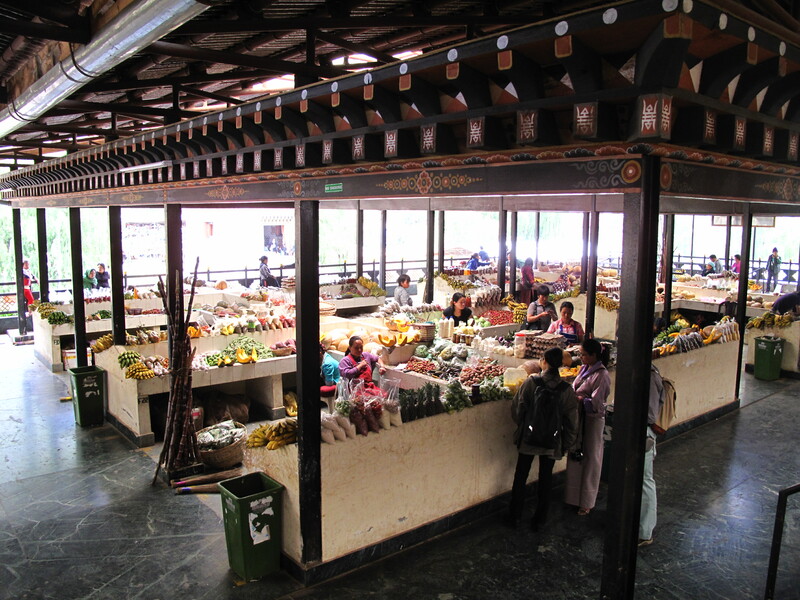 The fresh veggies are excellent, cheap, organic and locally grown and we purchase these from the weekly veggie market in town housed in a huge two storey open sided concrete structure with local produce upstairs and imported produce downstairs. 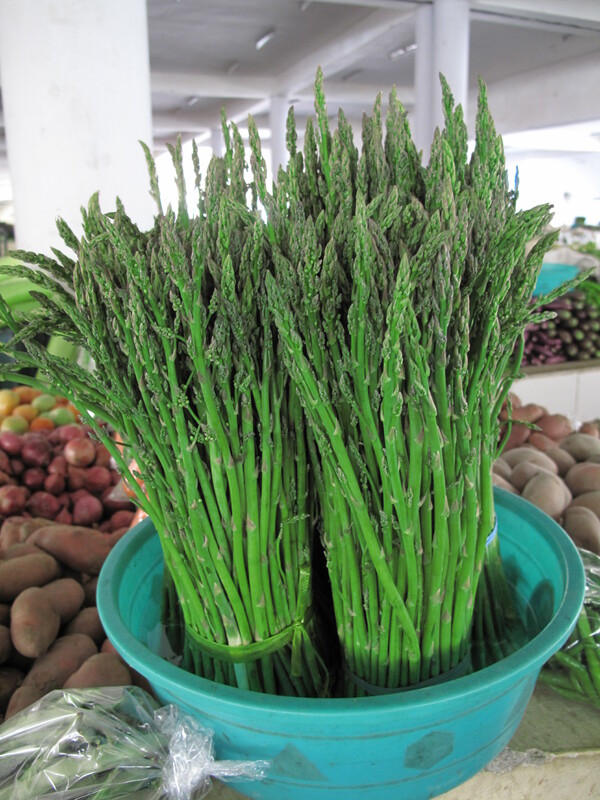 Asparagus is in season at the moment and is in plentiful supply. Most of the fruit is imported from India or transported from southern Bhutan where it is a bit warmer to grow things like bananas. No idea what this vegetable is but it tastes good! 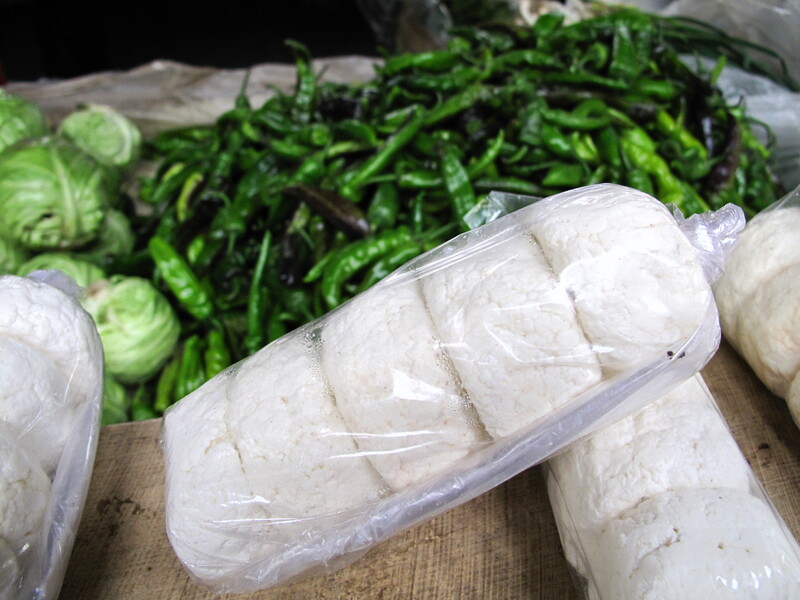 Bread is not commonly eaten in Bhutan and as such, when you can get it, it tends to be white and sweet. However, there are a couple of bakeries in Thimphu that bake brown and multi-grain loaves primarily for the small ex-pat market. One of these, “Big Bakery”, (which despite its name is a tiny place!) is a vocational training project for people with disabilities and is right opposite Jordi’s work so he brings us home a loaf every couple of days. Things like muesli, porridge oats, pasta etc. are all available at a handful of grocery shops around town, but expensive as they’re all imported. The drink of choice would have to be tea! There is Oja (milk tea), Naja (sweet milk tea) and Suja (butter tea). The latter is typically Bhutanese and often served at monasteries, but I just haven’t been able to develop the taste for it! Coffee is a relatively new phenomenon to Bhutan and not very popular but becoming moreso. 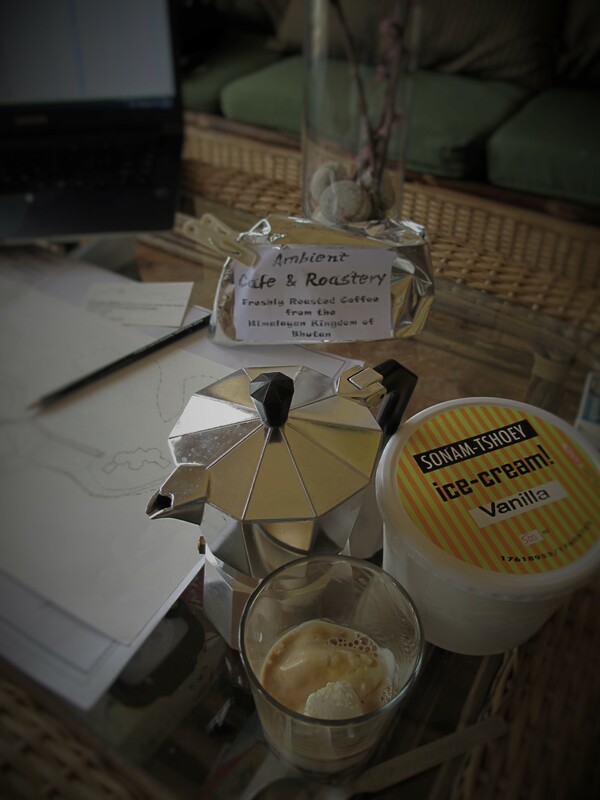 There are two cafes in town that roast their own coffee beans, again predominantly for the small expat market. The alcoholic beverage of choice is beer, followed closely by ara, a homemade rice spirit. 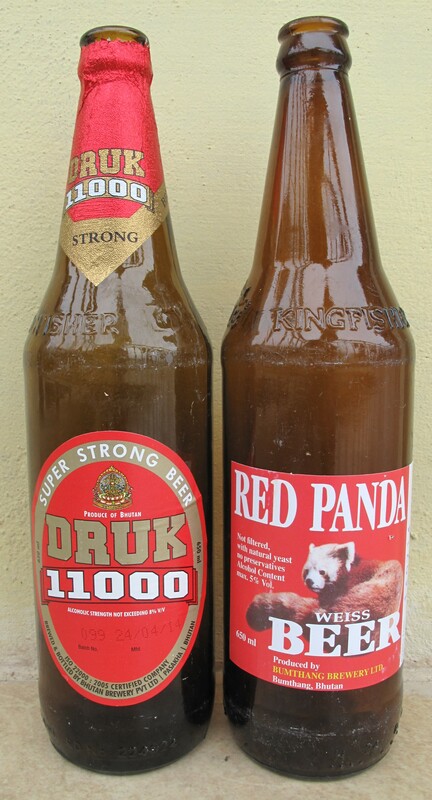 There are only a couple of beers brewed in Bhutan, the most popular being “Druk 11000” which packs a punch at 8% alcohol. It’s available at just about every corner store and grocery shop. There is also a micro-brewery in central Bhutan which brews a nice wheat beer called “Red Panda”, named after the iconic cat-faced racoon like mammal native to the Himalayas currently classified in danger of becoming officially an endangered species. The brewery (Bumthang Brewery Ltd) was established by a Swiss brewer in the 60’s and Red Panda is touted as Bhutan’s best beer. For better or worse, the ban on importing Fosters into Bhutan was recently lifted! But I am thankful to a vigneron from Victoria, Australia, who established a relationship with Bhutan some years ago, and as such it is possible to buy good Aussie red wine here! There are a couple of local wines, but let’s just say we gave them a try and we’ll leave it at that! Here in Thimphu there is quite a good selection of restaurants and cafes. 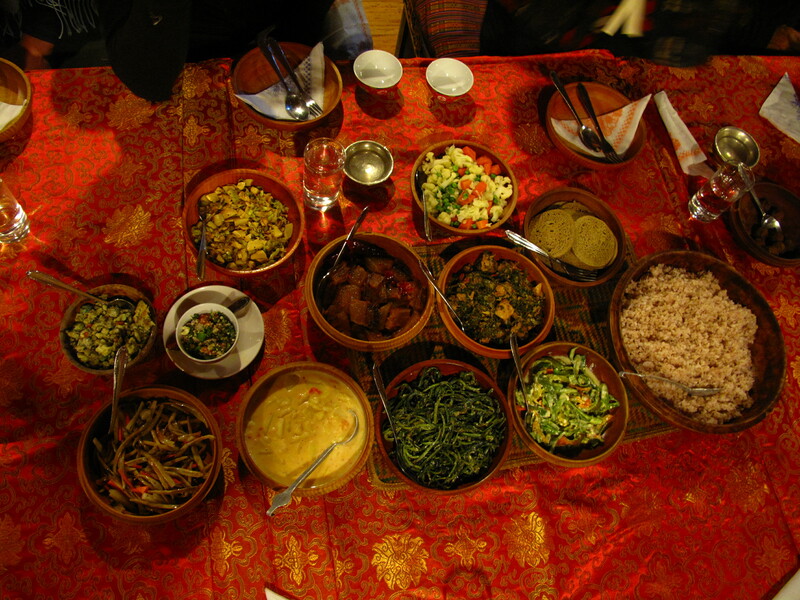 In terms of cuisines, the majority are Bhutanese and Indian. But when we feel like a bit of a “western food” fix then there are a couple of pizza places and burger bars, as well as a Thai, a Korean and a Mexican restaurant. Our favourite fast food snack when we’re out and about is “momo’s” which originate from Nepal but have been absorbed into Bhutanese cuisine. They’re essentially dumplings with different fillings, usually cheese and cabbage or beef. Not too dissimilar to Polish pierogi! So, really we don’t feel like we’re missing out on much at all as far as food and beverages are concerned, and hope to expand our repertoire of Bhutanese dishes throughout the year. 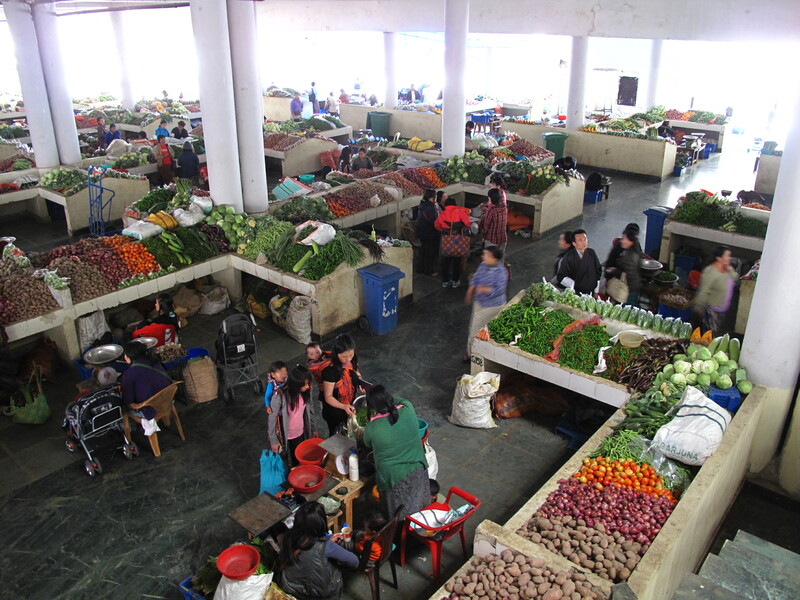 This Post was tagged ara, beer, bhutanese drink, Bhutanese food, buckwheat, druk 11000, eating in Bhutan, ema datsi, expat living in Bhutan, maize, momo, organic, red panda, red rice, suja, Thimphu vegetable market, yak. Bookmark the permalink. 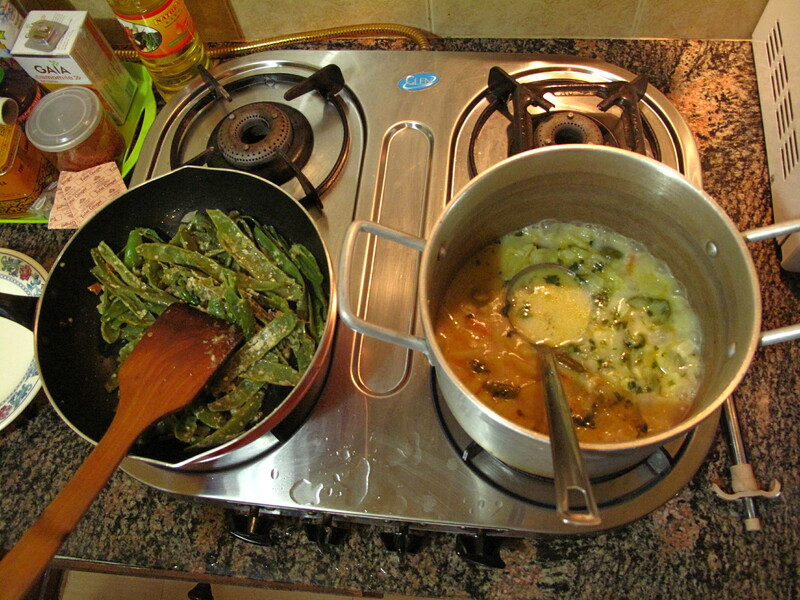 the green vegetable in the photo looks like okra. Bit slimy on the inside, but nice stir fried, especially with chilli! Hi Rosa, I’m familiar with okra, and it’s not okra. I’ve since discovered it is called “olachoto” in Dzongha or “Crows Beak” in English. 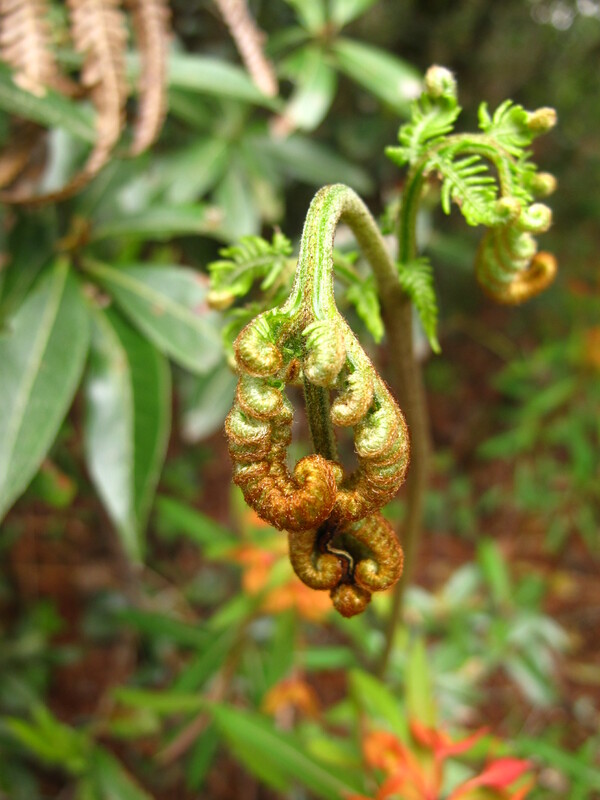 I believe the latin name is Cyclanthera pedata. So in other words, I’m unlikely to find it at the local Woolies! Very interesting . Momos are my fAvourite Nepalese food too. Fried ferns, chilli and cheese sounds an interesting combination. It could be a TV snack dish. The green vegetable is ‘Tendli’, which is very popular in India. Its English name is Ivy Gourd.